The Philadelphia 76ers landed their first No. 1 overall draft pick in 20 years on Tuesday at the NBA's Draft Lottery. Philadelphia have endured a dreadful three-year stretch that was a part of a rebuilding plan to restock the franchise with top picks. They finished this past season with a league-worst record of 10-72 giving them the best chance at getting the No. 1 selection for the June 23 Draft. It paid off as they came out ahead of the Los Angeles Lakers and Boston Celtics, who will draft second and third. "My immediate thought goes straight to the city of Philadelphia," 76ers coach Brett Brown said. "They have been amazing in allowing us to go through the process we have. We're excited about the news we have tonight." The last time Philadelphia were in this position they chose Hall of Famer Allen Iverson first overall in 1996. Their recent results have been mixed as they drafted Jahlil Okafor and Joel Embiid in the top three of the past two drafts. Embiid has yet to make his debut due to foot surgeries, while Okafor is coming off a solid rookie season. 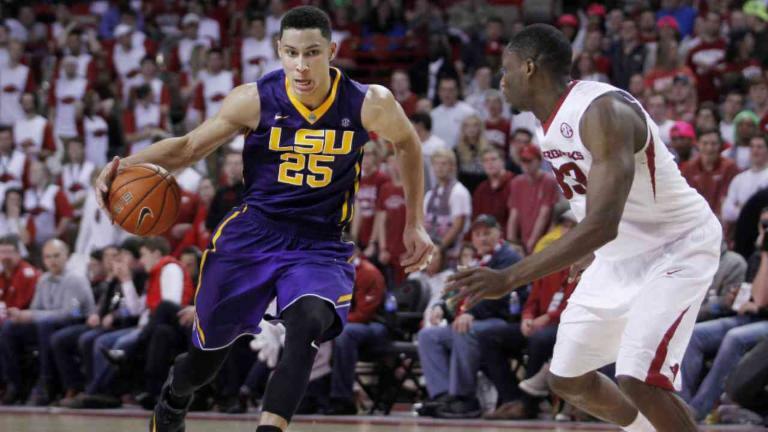 LSU standout Ben Simmons and Duke's Brandon Ingram are expected to be the first two choices in the upcoming draft. We're trying to hold judgement given he's still just 22 years old, but it's not looking too bright for former No. 1 overall pick, Anthony Bennett. The Cavaliers dealt him to Minnesota in the Kevin Love trade, and after averaging five points per game over 57 contests last season, the forward is on the trading block again. It's unfortunate that Cleveland selected him in a position he had no business going, and ruining his mental stability in the process. Thought of in the same breath as Kyrie Irving during the months leading up to the 2011 draft, Derrick Williams eventually got scooped up at No. 2 by the Minnesota Timberwolves. The freakishly athletic forward has never been able to make his talent translate to the pro game after dominating at Arizona. He's on his second NBA team, averaging nine points over his first four years. A sixth-overall selection, Robert "Tractor" Traylor never amounted to the star Milwaukee drafted him to be. He spent just a pair of seasons with the Bucks, averaging 4.5 points in 13 minutes before moving on to the Cavaliers and Hornets. One of the league's most imposing figures averaged five points over his seven pro seasons. "Mr. Basketball" in Indiana during his high school days, Jared Jeffries was the 11th overall pick in the 2002 draft by the Wizards. He actually managed to bust twice, averaging just six points and five rebounds with the Wizards, then garnering a five-year, $30 million deal from the Knicks -- where he posted even lesser numbers. And to think the Timberwolves went out of their way to sign this guy to an illegal contract. The 1995 No. 1 pick got off to a fine start over this first three year swith the Warriors, but it was all down hill from there. Joe Smith spent 16 years in the league with 13 different teams, averaging 11 points and six rebounds. Not bad, but for a first-overall pick, not good. Even in the famed 2003 draft class, the Knicks still managed to disappoint with their ninth-overall selection of Georgetown big man Mike Sweetney. Listed at 275 pounds as a rookie, Sweetney ballooned to 450 by the twilight of his NBA days with the Celtics. In two years with the Knicks, he averaged seven points and five rebounds. The second of three point guards not named Stephen Curry selected by Minnesota in 2009, Jonny Flynn was taken with the sixth overall pick. Flynn held down the point guard position in Minnesota during the late 2000s, and it didn't go as planned. The Syracuse product actually performed so-so in his rookie year, when he started 81 games, but tailed off dramatically after. He's been out of the league since 2012. Going eighth overall in 2008 out of West Virginia, Joe Alexander showed us one of the most swift exits from the NBA ever. After a sub-par rookie season in Milwaukee, he was shipped out to the Bulls, where he eight games in 2009-10 before falling out of the league all together. The mustached man out of Gonzaga lasted just four years in the pros before falling out of the league, averaging just 11.5 minutes per game after his rookie season. But the 6'8" forward is a two-time NBA champion, watching from the bench as his Lakers teams won back-to-back titles in 2009 and 2010. With Michael Jordan still on the board in 1984, Portland selected then-promising big man Sam Bowie with the second overall pick. Battling injuries, he played in just 139 games over five years, posting 10.5 points and 8.1 rebounds over his Blazers tenure. He spent more than a decade in the league as a serviceable role player, but will rest in basketball lore as one of the biggest busts in sports history -- thanks to MJ. Reaffirming every NBA team's fear of drafting relatively unknown European players, Darko Milicic was famously selected second overall in 2003 by Detroit. Just after LeBron James, and right before Carmelo Anthony, Dwyane Wade and Chris Bosh. He'd last just two-plus seasons there, leaving Pistons fans wondering how much successful their already-great teams of the mid-2000s could've been. NBA playoffs: What channel is Warriors vs. Thunder Game 1 on?